Our modern institution now offers some of our most popular courses in an online learning environment. is a passion or a hobby, so why not turn that passion into a new career. Over 2000 people have taken our courses and have become certified trainers! With over 2000 certified trainers and counting, Sport Performance Institute (SPI Certification) is the right choice for you! Simply put, its the most accredited fitness and sports education organization available. The Sport Performance Institute (SPI Certification) is a fitness and sport education company. SPI Certification provides education programs to personal trainers, aerobics instructors, coaches, strength training specialists, physical education teachers, athletes and the general population, both in Canada and the United States. SPI Certification currently has certification programs that meet or exceed the guidelines established by the National Fitness Leaders Advisory Council (NFLAC) in personal training, strength training, and aerobics instruction. The depth of knowledge that SPI Certification graduates obtain is the highest in the industry! In fact many of the topics covered in the SPI Certification certification programs are not covered in most University degree programs. Our trainers love SPI Certification! SPI Certification personnel have been involved in the setup and day to day operations of both the Human Kinetics Assessment Centre. With many years of experience in both test design and implementation. SPI Certification has the staff that can provide fitness appraisal services to a variety of groups and individuals. ACSM The American College of Sports Medicine’s Professional Education Committee certifies that “Sports Performance Institute” meets the criteria for official ACSM Approved Provider status from (2015 – December 2018). Providership # 763591 SPI will provide to attendees ACSM Approved Continuing Education Credits (CECs) so that they may document the number of CECs earned from each course or Workshop. Proof of continuing education is required to renew any International Fitness Certification. Over 2000 certified, Let’s See What Some Have To Say? We love our trainers, and are fully dedicated to keeping their trust. When you take a course at SPI Certification, you won’t ever have to worry about customer satisfaction! 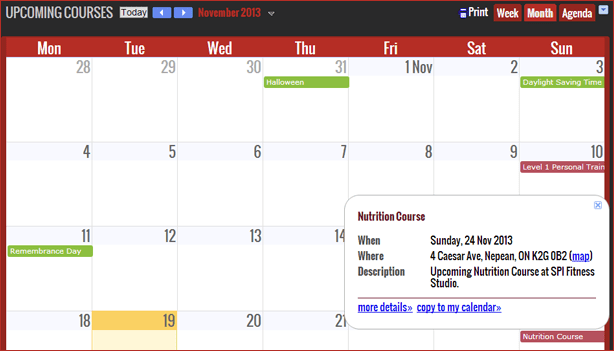 We update our course periods calendar regularly. We understand that Organizing your schedule shouldn’t be a burden. You can choose to be notified by email or receive text messages directly to your mobile phone. Looking to renew your certifications? No Problem! Click the button to get more information and the renewal form.